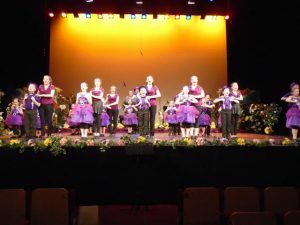 ‘HAPPY DAYS’ comes to Halifax, so join our students today! ‘HAPPY DAYS’ is a heart-warming, catchy musical which has been adapted from the famous television series where Henry Winkler played the ‘Fonz’. 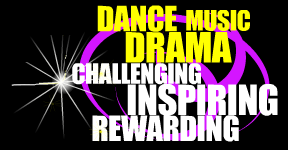 It is bursting with high spirited dancing, lyrical songs and comedic script. 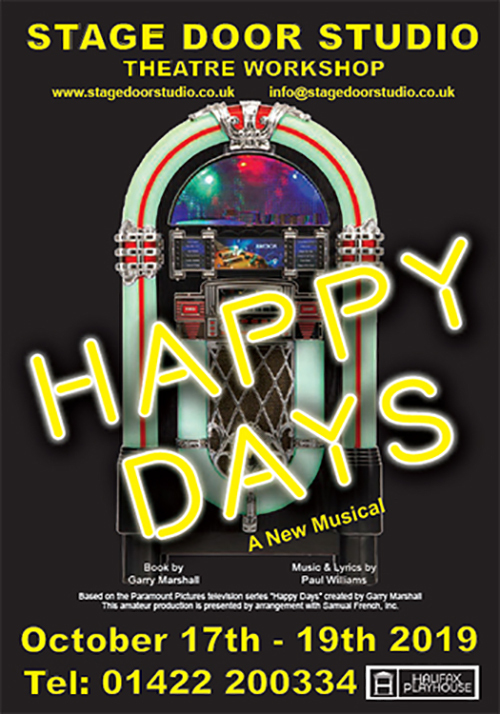 Stage Door Studio Theatre Workshop is pleased to present ‘HAPPY DAYS’ from Thursday, 17th October to Saturday, 19th October 2019 at the Playhouse, Halifax. The “New York Daily News” wrote: “If you like GREASE you will LOVE Happy Days” – A powerhouse rock and roll trip down memory lane”. So here is Stage Door Studio Theatre Workshop, it is 1959 in Milwaukee, Wisconsin with Richie Cunningham and his best friends Potsie and Ralph who are about to graduate high school and go off to college. His friends and family meet at Arnold’s malt shop where the bad news is broken that a construction company has plans to turn the restaurant into a shopping mall, but Arthur Fonzerelli, ‘cool’ Fonzie vows to save the day. Pinky, who used to have feelings for Fonzie see each other for the first time in years, but love is not smooth & there is a bumpy road ahead. Later on after a frenzied time, Fonzie rolls in on his motorbike & offers to fight for Arnold’s, with Richie’s help, the good guys prevail. The ‘Fonz’ announces to a joyous crowd that enough money has been raised to save Arnold’s, so the Class of 1959 Graduation Dance begins. Everyone comes together to celebrate the ‘HAPPY DAYS’ they have spent as the 50s draw to a close and the gang gets ready for the 60s! A real ‘feel-good’ factor, we are to be treated to a winning, lyrical score, first-rate acting and lovely ‘rock n’roll’ dance performances. So join our students and see what happens to Fonzerelli and his girlfriend Pinkie, as they embark on the journey to says the famous Diner: ‘Arnold’s’! So please email info@stagedoorstudio.co.uk for joining details, show and ticket information. Don’t miss out on this great high-kicking show, something for all the family to take part in and enjoy!